The Golden Eagle Trust have since 2011, and the loss of several red kites to rodenticide poisoning in North Dublin, been working with a suite of project partners including statutory and non-statutory agencies to help combat secondary rodenticide poisoning of wildlife. 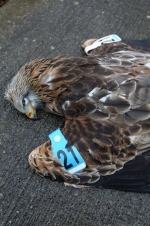 Nine red kites were found dead in the autumn and winter of 2011 after the releases in Fingal. Subsequently six of these were confirmed to contain brodifacoum, a second generation anti-coagulant rodenticide (SGAR). This unfortunately this included the death of the satellite tracked red kite Blue White @ (depicted in the photo) that had travelled more than 190km out west to Co. Mayo in her first weeks after release and was subsequently found dead near Lusk, Co. Dublin a few weeks after her return. Red kites are particularly susceptible to accumulating rodenticides and eat large numbers of rats and they are specialist scavengers. In particular they may eat dead or dying rats and may therefore be exposed (accidently) to rodenticides in their prey. The Golden Eagle Trust welcomes the launch of the Campaign for Responsible Rodenticide Use (CRRU) in Ireland and urges people to get involved, spread the information and think about the use of rodenticides and our native Irish wildlife. At the Ploughing championship today the Irish Campaign for Responsible Rodenticide Use was launched by the Minister for Agriculture, Food and the Marine Simon Coveney. Anticoagulant rodenticides used to kill rats and mice have been detected in many of our top predator wildlife species. Recent scientific research has shown that they now occur in over 80% of our barn owls who feed mainly on mice and rats. Other rodent-eating species such as kestrels, long eared owls, kites, buzzards as well as pine martens, stoats and foxes are all vulnerable too. While pests such as mice and rats which can contaminate food and carry disease must be controlled, the rodenticide industry has recognised the need to protect and enhance wildlife. In order to ensure that rodenticides are used correctly and in ways that minimise the exposure of wildlife, the Campaign for Responsible Rodenticide Use (CRRU) has been initiated in Ireland. It has been set up under the chairmanship of Dr. Mark Lynch, former Senior Inspector in the Pesticides Control Service of the then Dept of Agriculture and Food. It is supported by all the main manufacturers of second generation anticoagulant rodenticides that are in use in Ireland. Poor pest control practice has a negative effect on wildlife. CRRU Ireland will be raising awareness of how to use rodenticides in a responsible manner by having a planned approach, by using enough baiting points and by never leaving bait around at the end of treatment. Owls and birds of prey play a role in keeping down rodent numbers around farms and food manufacturing plants. It is vital to ensure that rodents that are dead or dying after ingesting rodenticides are disposed of correctly and are not available to wildlife higher up the food chain. Launching the company Minister for Agriculture Simon Coveney said “I am very proud of the clean green image that our food products have, both here and overseas. It is equally important that we maintain this clean healthy reputation for our wildlife as well. While it is essential that rats be controlled it should be done in a manner that does not harm non-target species such as barn owls and kestrels”. Red Kite Blue Red 42 Poisoned! A red kite recently discovered in Vartry Reservoir, Roundwood, Co. Wicklow has been confirmed as poisoned. The bird, identified as Blue Red 42 an Irish bred kite, was reported by a concerned dog walker to Birdwatch Ireland who informed the local National Parks and Wildlife Service staff. An investigation into the matter was immediately begun. A National Parks and Wildlife Service Ranger responded to the incident and located the carcass which lay only a few hundred metres from residential houses and a local pre-school. The bird which appeared in good condition had a mouth and crop full of fresh food, indicating that cause of death was most likely poisoning. The Vartry Reservoir is used for recreational walking and angling and provides drinking water to the southern suburbs of Dublin. Minister Deenihan said "The Red Kite is a magnificent bird of prey and is protected by law. I know every effort is being made to find the culprit in this incident, and I would call on any person with any information about this matter to contact the National Parks and Wildlife Service of my Department or An Garda Siochána. The use of this type of poison is strictly limited to the eradication of mice and rats, and should at no time be used in the reckless way it was." Tests were immediately ordered under the bird of prey post-mortem protocol. A scheme operated by the National Parks & Wildlife Service, the Regional Veterinary Labs (Department of Agriculture, Food and Marine) and the State Laboratory (Department of Finance). Within 48 hours thanks to the experts within the Regional Veterinary Lab and the State Laboratory, both located at Celbridge, the bird was confirmed as having been poisoned by alphachloralose. The legal use of alphachloralose is restricted to the control of rats and mice. Furthermore the stomach contents of the red kite indicate that the poison was placed on meat bait, a practice now banned, largely for the protection of birds of prey. Searches of the area for further casualties or poisoned baits and door to door enquires were conducted by National Parks and Wildlife Service staff and local Gardaí. The Kite was a wild-bred Wicklow kite from 2012, only 14 months old whose parents were originally brought over from Wales in 2008. The landowner, on whose land the kite was born is very disappointed to hear it has been found dead. Red Kites have only recently made their way as far north as Roundwood and it will be disappointing for many of the locals that had been enjoying their presence to hear of the poisoning. Dr Marc Ruddock, Red Kite Project Manager, for the Golden Eagle Trust said “This is the height of recklessness and it is imperative that communities and individuals take responsibility for getting the people who are still laying poison to stop immediately. The costs are high for Irish wildlife and the potential human consequences of this incident don’t bear thinking about!” Dr Ruddock, urged people to report any information to National Parks & Wildlife Service (NPWS) or An Garda Siochana and also report poisoning to their local Department of Agriculture office. The Dublin Red Kite Blue White B3 has been helped by the amazing actions of Nessie Bergin and north Co. Dublin farmer David Garrigan. Mr Garrigan who initially found the tagged kite in a potato field knew it was from the reintroduction project. He alerted Nessie who was able to deftly capture the red kite and place it in a box for the Golden Eagle Trust volunteers to collect and take to the project vet, Fintan Browne at Anicare Vets (Blanchardstown). The kite appeared weakened and was clearly in need of some care and very low in weight. It was found a short time some bad of weather and horrendous thunderstorm which may have downed the bird. A few days under Fintan’s expert care and the bird was transferred to aviaries getting lots of food in the form of dead rabbits and crows to speed its recovery. Blue White B3 was one of the original Dublin kites which was collected in 2011 near Rhayader in Wales with project partners the Welsh Kite Trust on the 12thJune 2011 and released from Newbridge Demesne on the 26thJuly 2011. She has been seen on numerous occasions by the project team at winter roosts since her release over two years ago and had set up a territory earlier this summer. The 29 pairs of Co. Wicklow kites produced 29 young during 2013 and whilst five pairs were located in north Co. Dublin, none of these were recorded to successfully breed. The Dublin project was initially set back by the loss of nine birds of which six were confirmed to have been subject to accidental secondary poisoning by rodenticides (rat poison). Dr Marc Ruddock, Red Kite Project Manager said “We were devastated at the initial losses, but we have done considerable awareness raising of the issue and there is extensive support amongst landowners and communities within the area for the birds and we are not aware of any further losses. The Dublin kites are still very young to breed at only two years of age but it is an encouraging sign that pairs have been established – we hope next year, 2014 will see the first Dublin red kite chicks. Dr Ruddock continued, “We would remind people especially as we approach the autumn when rat populations disperse following harvesting to be mindful of the red kites and other wildlife when using rodenticides”. Before she was released the project team, under specialist licencing, have tagged Blue White B3 with a satellite transmitter to allow us to follow her progress and movements over coming weeks and months. The bird was returned to the wild by Nessie who rescued the bird and she said “I have decided to name her Hera who was a goddess of the sky and I hope she finds a good man goes on to have many young red kite chicks in the coming years”. As Nessie opened her hands to release the bird back to the wild she said “Fly free” and a silence descended over the small group of volunteers and locals as we were all humbled at being part of the process to allow the bird another chance at freedom in the wild. The Red Kite Project is a partnership between the Golden Eagle Trust, National Parks & Wildlife Service (NPWS) and Welsh Kite Trust and in Dublin was funded by the Fingal LEADER Partnership and the Department of Arts, Heritage & Gaeltacht and supported by KPMG, Fingal County Council, Fingal Conservation Volunteers, Birdwatch Ireland, Irish Raptor Study Group, AOL Monster Help Day and Burren Bird of Prey Centre. The local NARGC also provided all the food for the kites whilst they were in the cages. The Golden Eagle Trust are grateful for the interest and support of all the residents and farmers of north Co. Dublin for the Irish Red Kite Project and particularly would like to thank David Garrigan, Nessie Bergin, Ciaran O’Keefe, Lorcan O’Toole, Samantha Rhodes, Fintan Browne (Anicare), Trevor Roche (Dublin Falconry), Ciaran Dunne, Derek O’Brien (NARGC), NPWS and British Trust for Ornithology for their help in returning Blue White B3 – Hera – back to the wild. Special thanks also to Paul Kavanagh and Outdoor Studio, Skerries (Eamon & Christine O’Daly) for the photos.